Submitted photo Justin Lightfoot, left, and Brandon Lightfoot show off their deer they shot during a hunting trip in Missouri on opening day. 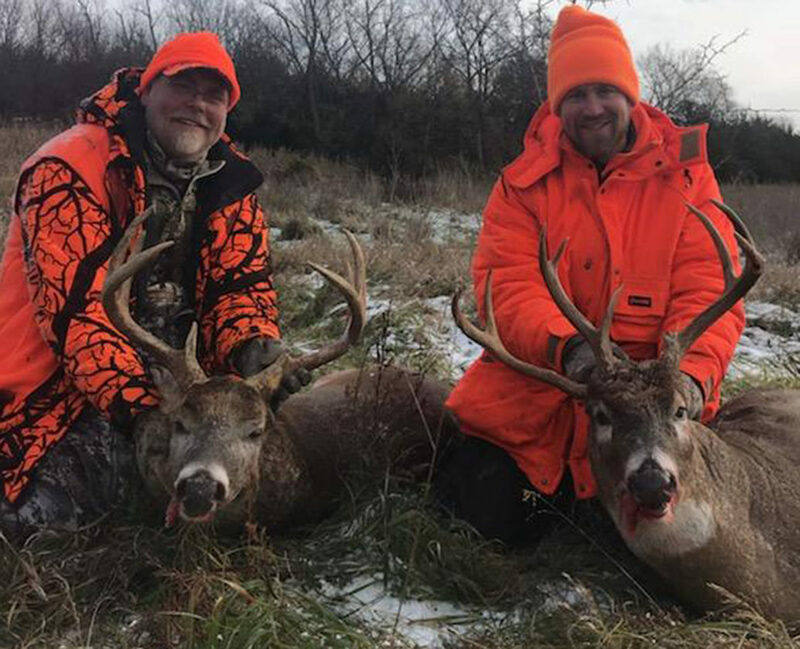 Brandon Lightfoot, from Lucan, and his brother Justin, from Vesta, went on their annual deer hunting trip to northern Missouri. Opening morning was extremely cold at a bone chilling 9 degrees. After a fulfilling breakfast we set out to our location. Sky was clear and already getting light. We sat on opposite ends of the same piece. It was nearing 9 a.m. with the wind howling in my face, my feet feeling like stubs. I stood up and seen my brother walking toward me. At the same moment he lifted his gun and engaged a target. He than waved me over to his location. I quickly loaded my gear and sped over to hear what he had to say. He said he shot a monster at the edge of the corn. We decided to put our gear down and go check it out. At this point I could see the pickup 100 yards away. My fingers completely numb, not able to work, and not sure if my toes had frost bite. I wanted to sit in the pickup and warm up. At the same time I realized I had to see my brothers face when we got to see how big the deer was. I instantly changed my mind. We made our adventure down the hill we can see stained grass, but no deer. We were about 15 yards away. Justin says in a urgent excited voice “shoot that deer.” I looked harder into the corn thinking his deer was only wounded and got up. He then points over to the side. I finally catch a glimpse of him as he bolts. As he speeds up the hill I try not to focus on his antlers gleaming in the sun. I pulled up my 6.5 Creedmoor and ever so gently squeeze the trigger as my crosshairs center on the shoulder. Justin said he heard a thump and the deer was gone over the terrace. We both are in complete shock trying to piece together all the details of what just happened in the last 10 minutes. The excitement was followed with locating the deer with perfect ethical shot placement. The antlers got bigger when we found them and for the first time I realized my deer has three antlers coming out of the base.